Do you know someone who’s been arrested and taken to custody in East Los Angeles? If so, they’ve likely been taken to the East Los Angeles Station Jail. Also, often referred to as the Maywood Jail for booking and processing. If you’re wondering how to get them out of jail fast, and you require an East Los Angeles Station Jail bail bond, you’ve landed in the right place. Our staff has years of experience in dealing with the jail system and a fully licensed, professional bail bondsman is able to take your call immediately. If you need to speak with a bail bondsman right away, feel free to call us any time at 855-414-BAIL (2245). Someone is available 24/7 to take your call and answer any questions you may have. The Los Angeles County Sheriff’s Department contracts with the city of East Los Angeles to provide its law enforcement needs. 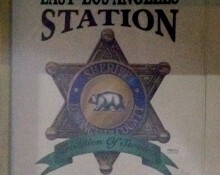 In addition to East LA, the LASD deputies working out of the East Los Angeles Station patrol the cities of Commerce, Cudahy, Maywood, and Terrace, as well as unincorporated areas including, Belvedere Gardens, Eastmont, Saybrook park and Union Pacific. The jail located on-site at the East L.A. Station is small, and designed only for the temporary housing of inmates. The longer an inmate is in custody without obtaining a bail bond, the more likely it will be that he or she is transferred to one of the larger jails in downtown Los Angeles. Male inmates are typically transferred to Twin Towers Correctional Facility, while female inmates are sent to the Lynwood Jail. In order to secure the fastest possible release of your friend or loved one, it’s best to get the bail bond application process started as quickly as possible. If they are transferred to one of the larger jails, they will likely end up spending at least an additional 24 hours in custody as they are processed in to the new location. Bail is set by judges, and it is laid out in the county’s “bail schedule.” Basically, the amount of bail will vary depending on the nature and number of crimes an individual is charged with. The county bail schedule is a guideline that judges use when setting bail, but the judge has the final say. The deciding factor in the amount of bail that a judge will set is always going to be the safety of the community. Generally, those who’s crimes pose little danger to others are likely to receive a smaller amount of bail than those who are suspected of committing violent or dangerous crimes. If you’ve never been through the bail bond process before, it’s probably a lot easier than you think. It begins by calling us and providing some general information about the inmate, including their name, birth date and date and time of arrest. We will use this information to locate him or her within the system and quickly verify their eligibility for bail. Once this has been established, it’s simply a matter of filling out the short, straight-forward bail bond application forms and indemnitor’s agreement. After that, we will dispatch one of our agents to the jail and your friend or loved one will be released a few hours later. Technology being what it is, the entire bail bond application process can be completed from anywhere. We can get the forms to you via fax or email without ever having to meet with you in person. It is our mission to make the process as convenient and low-stress as possible, and if that means you’re more comfortable handling it from home, then that works just fine for us. The indemnitor is the signer of the bail bond. It’s the person accepting financial responsibility in the case that the inmate fails to meet their court obligations once released. As long as the defendant meets all of their court obligations nothing more is ever owed. However, if they fail to do so, it is the signer of the bail bond who will be responsible for paying the full amount of bail (which could be thousands of dollars) to the court. As a result, you should only ever bail out someone whom you know and trust. We accept a variety of payment options, including major credit/debit cards (Visa, Master Card, American Express and Discover) as well as cash, check, money order, bank account transfer and money wire. If you’d like to finance your bail bond, just let us know. We have a variety of flexible payment plans designed to fit most any budget. If you’d like additional information regarding East Los Angeles Station Jail bail bonds, feel free to give us a call any time. We’re here 24 hours a day, 365 days a year to take your call. Times like this can be stressful, and we strive to be available whenever you need us.